Swinging parking barrier gates are an economical and practical solution for efficiently controlling vehicle traffic at any facility. Our basic barrier arm gate is priced attractively, operates smoothly, and is available in exactly the length you require. From industrial settings and government facilities to residential and recreational properties, these gates provide a low cost solution to access control in many situations, such as parking lots and parking ramps. Traffic or parking barrier arm gates can be operated manually, and can be easily locked to prevent unauthorized access at any time. In many settings, such as parks and other recreational facilities, they are opened at a particular time of day to provide free entry to the facility, and then locked when the facility is closed to prevent vehicles from entering. In such situations, manual operation is more than adequate. Cost does not include reflective tape as shown on above image. Gate size is measured by the opening between the post. Call for hinging and latch pricing if needed. Where the traffic and parking barrier gate will be frequently opened and closed, an automatic gate operator can open and close the gate, using a wide range of control systems. Control systems can use keypad codes, radio control, card readers and other methods to make access simple for authorized personnel, but keep others out of the area. Our security gate supply company is proud to offer these high-quality, low cost barrier gate operating solutions to our customers. Whether you use them manually or have us supply you with a compatible Swing Gate Operator, every gate will provide smooth, reliable vehicle access control for many years to come. Our low prices are unmatched because of our volume-purchasing arrangements with the manufacturers. We ship our products to you directly from factories to minimize your shipping cost. 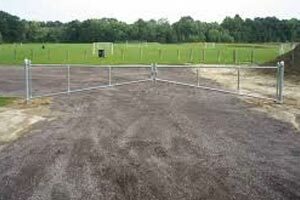 When you need a traffic barrier gate, you can count on us for quality and low cost. As a low-cost security gate supplier, we understand that simple, economical access control solutions are often best for many situations. But economical solutions should not be cheap, low-quality solutions. Only high-quality traffic barrier gates can provide the long-term service that means true value. You can always count on any barrier gate supplied by International Security Products to give you the quality and performance you expect and deserve. Contact us today to discuss your parking barrier gate requirements or request a price quote on a barrier gate or any other product. Our experienced access control consultants will be glad to answer all of your questions and to recommend a product that fits your requirements perfectly.